“So…were there any cringe-worthy moments once you returned to sobriety at work?” Because once I had told my sister about the moonscape surface of Mount Etna, diving from a boat into crystal clear waters in Giardini Naxos, strolling around the winding streets of Taormina and how my knees ached from dancing, she didn’t want to hear anything else that was great or that hurt: she needed gossip. My mind raced through the events of the last four days in Catania with 60 co-workers and the 5 company founders. 25 different nationalities, free food and booze - average age about 29. Certainly great source material for some juicy stories. 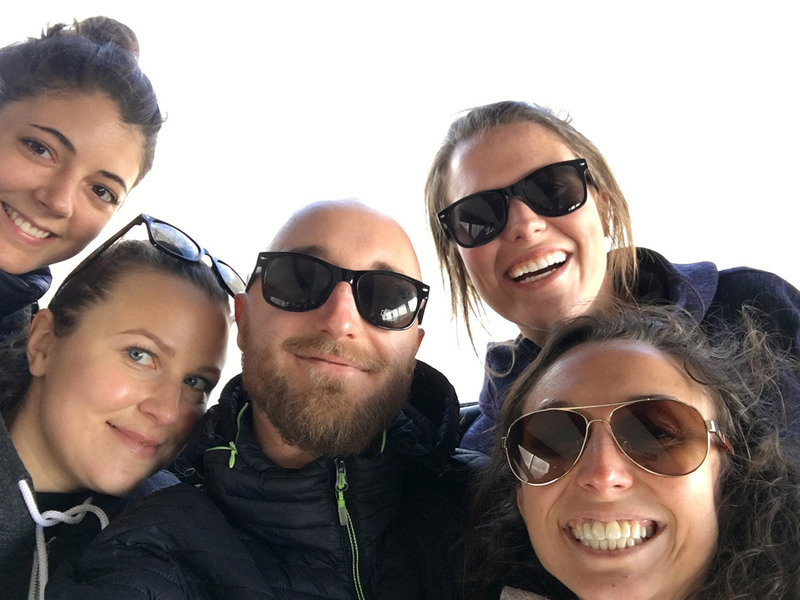 “Well, they did remind us before we left that we were representing the company on this trip and we were expected to join in.” At Remerge being asked to not do anything the founding team wouldn’t do is hardly a buzz kill. 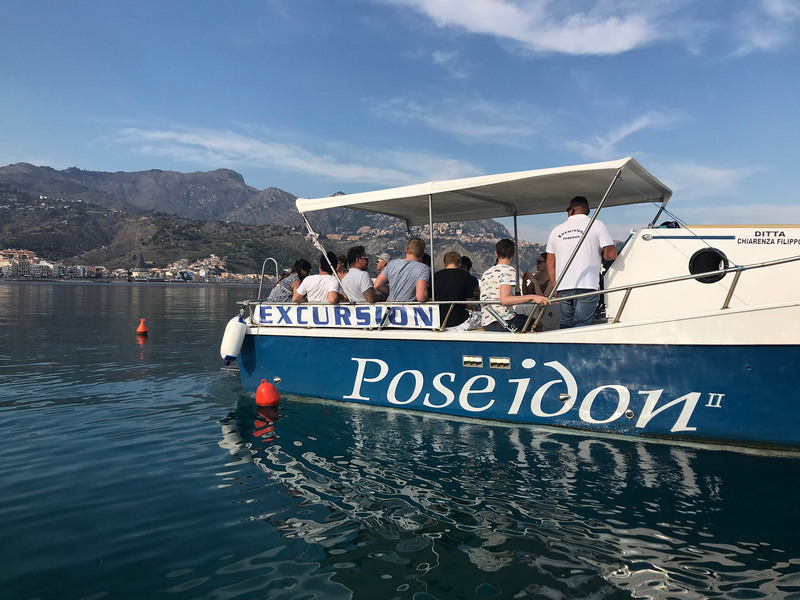 In fact, in the days that followed, I saw them initiate mosh pits and lead a posse of other adrenalin junkies up a treacherous cliff face to dive into the water, much to the alarm of our boat captain. 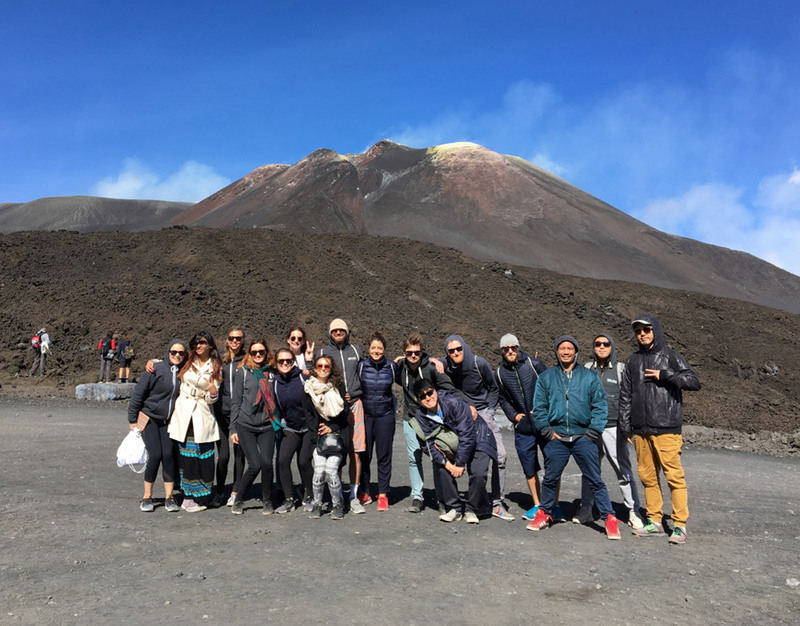 A lot of planning and fine-tuning had led to a program that made the most of the time available which included restaurants, bars, boat trips, a cooking class, sightseeing, body-rafting and climbing a volcano. I wasn’t concerned about behaving: I was worried about keeping up. Mount Etna loomed in the distance. “Is that smoke coming out of the top?” I asked Pedro nervously. It was. I was beginning to have second thoughts about hiking to the summit, already unnerved by the steep uphill bus journey to the base. People were putting on their fleeces as we got off the bus and I could see a picturesque village down below. I didn’t like it. At the top of the first crater, I knew that I didn’t want to continue, but I also couldn’t face going back. As always on this trip, I wasn’t alone. Someone else couldn’t take it anymore either. We held hands and ventured back to the bottom. After unlocking our sweaty grip and laughing at ourselves, we enjoyed the sight from a bar a safe distance away. Later, we joined the rest of the group for lunch as if nothing had happened. I’d seen the team spirit in action in the office a number of times. Whether it was a founder helping out an account manager with a particularly tricky account or a tech guy assisting a marketing team member setting up an office event, but I hadn’t expected to see it played out when I felt so alone in my own fear. Seemingly unsatisfied with my account, my sister sensed her chance to pry for real gossip and wanted to know about my least favourite activity. Reading the offsite agenda before we left, I felt reassured after seeing the choice of activities on offer. Body-rafting and climbing through an imposing basalt gorge more than 30 meters high sounded amazing but wasn’t for me. An excited team ready to cook! As rumours buzzed around the team that we would be learning to cook pasta from scratch from a real Italian chef, I felt like we were in for a treat. Our anticipation grew as we donned plastic hairnets and gloves and three Italian ladies showed us to our chopping boards. But it soon became clear that they were not going to let us near the pasta. We made a simple vegetable side dish, part of the team lunch later that day. It was a let-down, but we thoroughly enjoyed ourselves and had a laugh anyway. Afterwards, as we joked about our expectations versus the reality. 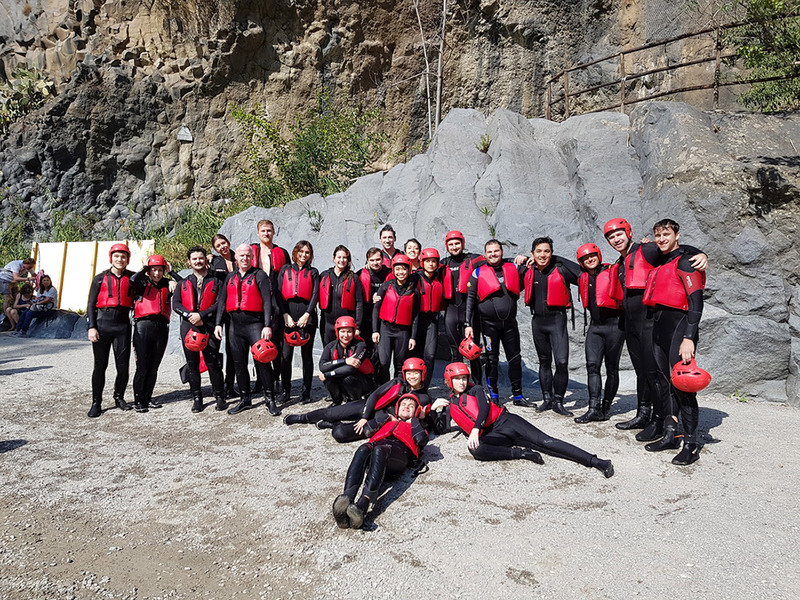 One colleague said, “even though the class was terrible, we had a great time evaluating it afterwards.” I told my sister that no matter who we were with, throughout the trip, it was the same: we had fun and made the most of every moment. “It’s a manager’s job to remove blockers, things that stop people from moving forward.“ During a training seminar as part of the pre-offsite, Pan, our CEO briefed us on good management at Remerge. He then went on to unwittingly use body-rafting during our trip that followed to prove his point. Because there is no experience quite like body-rafting when it comes to giving you the opportunity to find out where your blockers are. The name alone implies pain and danger. Tim showing everyone how it’s done: Safety position! I’ll take a massage at the beach instead, thank you! Their experience was great teamwork and managerial support in action. No one was left to struggle alone and if something seemed difficult, the founding team were there: they went first and then helped the rest of the team. Removing blockers, just as Pan said they would. Can I work there too? “Someone got stung on the bottom by a jellyfish,” I started, still trying to please my sister. “She was holding onto a rock and peeing at the time” “That’s nothing.” She was disappointed, but happy for me too. “It sounds amazing!” My eldest sister had finally caught up with the group chat. “You’ve really lucked out with them.” They were both right. It was an amazing trip with no drama and nothing outrageous to share. Besides, I wouldn’t gossip about my friends. Join the fun, we’re recruiting! Check out our careers page here!